Jarte's header and footer designer allows the creation of header and footer lines that appear on the printed pages of a document. There are definable left side, middle, and right side elements in both the header and footer lines. Each element defaults to being blank. An element can be changed by selecting it with the mouse and then using the element type tabs to define the element as desired. Jarte provides automatic header and footer line mirroring when performing double sided printing. Note: When the Header & Footer panel is first displayed most of its controls are disabled. Enable the controls by checking the Print header and footer check box. This is the default element type. Blank header and footer elements simply appear as empty white space in the header and footer lines. Prints the appropriate page number for each page of the document. Use Roman numerals: Determines whether the page numbers are printed as lower case Roman numerals rather than the standard Arabic numerals. Roman numeral numbering is limited to 50 pages (Arabic page numbering is unlimited). This setting is only available in Jarte Plus. Starting page number: Allows page numbering to begin with a number other than 1. Note that you can also specify a negative value! For example, if a value of -2 is specified then no page number will printed on the first three pages, and subsequent pages will continue as normal with the fourth page being numbered as "Page 1", the fifth page as "Page 2", etc. Use "Page" prefix: Determines whether the word "Page" is prefixed to each page number. Otherwise, just the page number itself is printed. p: This button allows the word "Page", used in setting Use "Page" prefix, to be redefined. This is useful when printing non-English documents where the word "Page" needs to be replaced by its non-English equivalent. Use "of" total: Prints both the current page number and the total number of pages on each page (e.g. "5 of 20" is printed on the fifth page of a twenty page document). o: This button allows the word "of", used in setting Use "of" total, to be redefined. This is useful when printing non-English documents where the word "of" needs to be replaced by its non-English equivalent. Prints a date. If a static date is desired then the "Text" element should be used instead. Use current date: The date used is the date the document is printed. Use file date: The date used is the date the document was last modified. Long format: The date is printed using the long date format typically used in your locale (e.g., "January 30, 2007" in the United States). Short format: The date is printed using the short date format typically used in your locale (e.g., "1/30/2007" in the United States). Note: The long and short date formats can be customized via the date and time format advanced settings. Prints the document's file name. Include file extension: Determines whether the document's file name extension is printed as part of the file name (e.g., "Gettysburg Address.rtf" as opposed to "Gettysburg Address"). Prints any user specified text. Jarte will substitute page numbering for "&p" if it is found in the specified text. Jarte will also substitute the total page count for "&t" if it is found in the text. Print header and footer: Controls whether the header and footer lines defined for the document are actually printed in the document's printouts. Suppress header: Prevents the header line from being printed on the specified number of pages of the document's printout beginning with the first page. 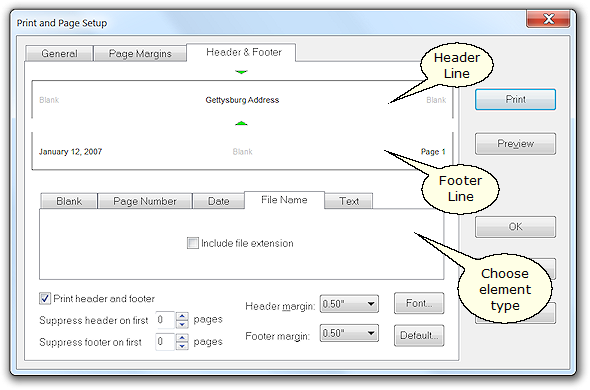 Suppress footer: Prevents the footer line from being printed on the specified number of pages of the document's printout beginning with the first page. Header Margin: Controls the distance between the top of the page and the header line. Be sure the header margin value is less than the top margin value! Footer margin: Controls the distance between the bottom of the page and the footer line. Be sure the footer margin value is less than the bottom margin value! Font: Controls the font attributes used to print the header and footer lines. Default: Saves the currently defined header and footer lines as the default to be used for all new documents. If the font chosen for the header and footer lines specifies use of the "underline" style then Jarte will use that as a signal to draw a horizontal divider line across the page. The divider line is placed just under the page header. In the case of the page footer, the divider line is placed just above the footer. Advanced settings used to control the header and footer divider lines are Header Line Spacing, Header Line Thickness, and Use Header Line.